Recently, Scenic and its sister line Emerald Waterways have been in the news, especially with Scenic’s planned expansion into ocean cruising in 2018. This week we have a closer look at their river operations in Europe. Elsewhere, with Seabourn president Rick Meadows in Europe, we look at their new Seabourn Encore, due out in January, and how she compares with other ships such as Regent’s Seven Seas Explorer, which enters service this summer. Finally, we have a quick look at what’s happening with cruise line stocks. In ocean liner days, there were many different classes over the years, but by the 1930s this had settled down to First, Cabin and Tourist Class, with Cabin equating to today’s airline Club Class and Tourist more or less to economy. And in more recent years, some cruise lines have been resurrecting First Class in new guises such as Grill Class, Suite Class, Yacht Club and The Haven. Because of the much smaller size of their vessels, this trend has not caught on with river lines other than in their branding. 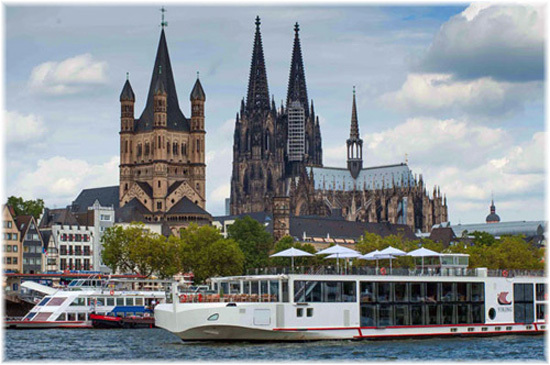 A large company like Viking River Cruises has an interesting approach. When it expects additional demand it just runs an extra boat, and instead of a capacity of just 190 it can now accommodate 380. Others, however, are beginning to take a different approach. One such is Australia-based Scenic, formerly known as Scenic Tours. To start with, on its own vessels, the product is First Class. You can put away your credit card because the product is totally all-inclusive and you won’t need it. Scenic has built a fleet of ten ships since 2008, all accommodating 167 passengers (the newer ones 169), with the latest, Scenic Jasper, Scenic Opal and Scenic Pearl, having joined the fleet within the last year or two. But unlike Viking, which just adds a “second section” to accommodate twice as many passengers, Scenic has done something totally different. It has opened up a new cruise line on the same waters to attract a different set of passengers, mainly younger. Instead of an “All One Class” approach, Scenic has come up with two different offerings, with Scenic as First Class and Emerald as a kind of Cabin Class with its own ships. Both lines are being sold as upmarket but those in the know, or those wanting to make a purchase, can see the differences. Emerald, which opened in 2014, is less inclusive, with the difference in starting prices for the peak summer 2016 Amsterdam to Budapest run at about £1,495. And where Scenic carries 167 passengers, Emerald carries 182, or 9% more, on a vessel of the same size. As Emerald’s ships are somewhat inclusive, it is easy to rate them as Cabin Class rather than Tourist, leaving Scenic to continue to run its First Class business. Emerald’s positioning was helped by the fact that it managed to have Twiggy christen its first ship, the Emerald Sky. Extras on Scenic include Occitane toiletries and luxurious bathrobes, a choice of flexible excursions and GPS Tailormade devices, dining in up to five venues on board, on shore cocktail receptions and unlimited laundry and pressing. Both lines have proven successful, and with Scenic now numbering ten vessels and Emerald soon to count five, Emerald is building two more for 2017. The 138-berth Emerald Liberté will sail the Rhône while the 112-berth Emerald Radiance will run on the Douro. Meanwhile, a recent shipyard fire on the line’s fifth ship, the 182-berth Emerald Belle, earlier this month was quickly contained but will slightly delay her entering service this spring. The builder used by both lines is Den Breejen Shipyard, near Dordrecht, which has produced ten “Space Ships” for Scenic and four “Star Ships” for Emerald so far. 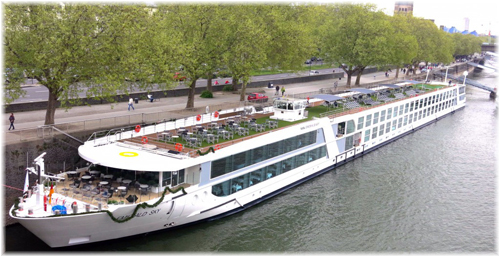 Since its start in 2008, and the opening of Emerald in 2014, the two river lines will have managed to amass a fleet of seventeen river cruisers in less than a decade. And that is not to mention the 228-berth ocean-going Scenic Eclipse that is now being built in Croatia for delivery in August 2018. The presence of Seabourn president Rick Meadows in the UK this month had people asking just how small is small when it comes to an ultra-luxury cruise ship these days. Having started with a trio of 212-berth ships that it has recently sold, Seabourn doubled up to 450 berths with its three Sojourn class ships in 2009-11. And with the new 604-berth Seabourn Encore and Seabourn Ovation, the first of which is due next January, Seabourn has now broken the 600-berth barrier. 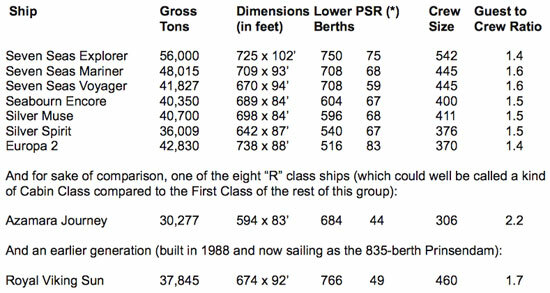 The guest to crew ratio on the new Seabourn ships is the same as Silversea’s, as is the Passenger Space Ratio (*). But with the addition of just a little length to the hull and another deck on top of the Seabourn Sojourn class, the new ship’s Passenger Space Ratio is 11% less than on Seven Seas Explorer and 20% less than Europa 2. In 1988, the author put money into a deposit on a house in Montreal instead of investing it in Carnival shares, which had floated just a few months earlier. Had he done the latter his investment would relatively quickly have turned into $1 million. As it was, he owned an investment in a house that would take twenty years to double. But then, as they say, stocks go up as well as down. Thus, after poorer than expected results at Royal Caribbean Cruises its shares dropped 11.8% in a week at the beginning of the month. This seems to have started a sell-off of cruise line stocks, which have taken quite a tumble so far this year. The loss was put down Royal Caribbean’s profit, which slumped last year by 12.9% to $665.8 million. This fall was largely due to a $411.3 million write-down on Pullmantur Cruises, which is shifting its emphasis away from the troubled Latin America market and back to its Spanish base. Total revenue meanwhile rose 2.8% to $8.3 billion. Year to date in 2016, Royal Caribbean stocks are down 33%, while Norwegian Cruise Line Holdings shares are down 34% and Carnival Corp & plc down 23%. With the prospect of a while new market in China, however, and oil prices dropping by half, not all the news is bad. All three companies showed slight increases on Friday.